Collect Free Chips for WSOP – Texas Holdem Poker. I will regularly update this post for new Redeem Codes. Note that you cannot claim them twice. Check-out the bonus page for daily free chips. If you don't like typing codes you can use the share links page to collect them. For some reasons these free chips don't expire. It is given to new players as days go on using Facebook Notifications... You cannot claim them twice so if you are a bronze playtika reward level make it to silver status so that your multiplier is times two (2x). The links are connected in our wsop free chips page if you are login the site will add it to your click history helping you avoid trying duplicate bonuses. 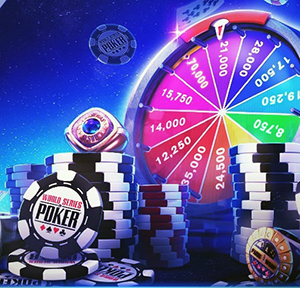 More free chips for new players amounting 100,000+ and some free mega spins. Check the old post in the share links page some of them just won't expire. * Sometimes they reuse these codes for yearly promos but that's very rare. The last time we tried the codes below all of them are expired, if some of them are active again please inform us. Please referer to the WSOP Bonus page if you want the summary for all free chips daily. 500,000 Free Chips Code: " MAYCOMEBACK "
03/07/2017 -- 7,000 Free Chips Code: " SPRINGTOURNEY "
02/28/2017 -- 50,000 Free Chips Code: " 5XMOMENTUM "
9/12/2016 -- 50,000 Free Chips Code: " QUADS "
2/22/2017 -- Mega Bonus Free Spin Chips Code: " megabonus17 "
01/26/2017 -- 10,000 Free Chips Code: " 3XGIVEAWAY "
01/20/2017 -- 8,500 Free Chips Code: " SAILBOATS "
01/06/2017 -- 8,500 Free Chips Code: " ACEMAGNETS "
12/02/2016 -- 8,500 Free Chips Code: " 2016COUNTDOWN "
10/23/2016 -- 50,000 Free Chips Code: " ROYALTY "
10/16/2016 -- 50,000 Free Chips Code: " RIVER "
10/09/2016 -- 50,000 Free Chips Code: " STRAIGHT "
10/03/2016 -- 50,000 Free Chips Code: " STEELWHEEL "
9/26/2016 -- 50,000 Free Chips Code: " DIMES "
12/07/2016 -- 8,000 Free Chips Code: " DOUBLE2016 "
9/18/2016 -- 50,000 Free Chips Code: " FULLBOAT "
12/02/2016 -- 5,000 Free Chips Code: " COUNTDOWN2016 "
11/29/2016 -- 10,000 Free Chips Code: " TRACY2016 "
6/5/2016 -- Mega Bonus Unlock Code: " SUPPORTROCKS "
10/31/2016 -- 25,000 Free Chips Code: " RIVERESPN "
10/23/2016 -- Mega Bonus Code: " WSOPROCKS "
11/24/2016 -- 5,000 Free Chips Code: " THANKSGIVING2016 "
11/24/2016 -- 5,000 Free Chips Code: " TURKEY "
11/09/2016 -- 10,000 Free Chips Code: " SPLITPOT2016 "
11/02/2016 -- 22,000 Free Chips Code: " QUADSESPN "
11/01/2016 -- 20,000 Free Chips Code: " STRAIGHTESPN "
10/20/2016 -- 10,000 Free Chips Code: " PRONTO "
10/19/2016 -- 7,500 Free Chips Code: " JAMIE2016 "
10/14/2016 -- 10,000 Free Chips Code: " BRACELETS "
10/12/2016 -- 10,000 Free Chips Code: " POKERFIVE "
10/08/2016 -- 10,000 Free Chips Code: " POKER5 "
10/13/2016 -- 10,000 Free Chips Code: " OCT132016 "
10/08/2016 -- 10,000 Free Chips Code: " SQUASHED "
9/22/2016 -- 6,500 Free Chips Code: " STATUSBOOST "
9/12/2016 -- 6,000 Free Chips Code: " FISHHOOKS "
8/26/2016 -- 10,000 Free Chips Code: " FANTASTICFRIDAY "
7/15/2016 -- 20,000 Free Chips Code: " TEXASROULETTE "
7/12/2016 -- 25,000 Free Chips Code: " PLAYWSOP "
8/12/2016 -- 10,000 Free Chips Code: " PODIUM16 "
8/06/2016 -- 10,000 Free Chips Code: " RIO2016 "
7/18/2016 -- Mega Bonus Unlock Code: " JAMIEISBACK "
7/24/2016 -- 10,000 Free Chips Code: " SURVEYCOMPLETED "
7/12/2016 -- 30,000 Free Chips Code: " TAGTEAM2016 "
7/04/2016 -- 10,000 Free Chips Code: " INDEPENDENCEDAY "
7/04/2016 -- 10,000 Free Chips Code: " JULY4TH2016 "
7/01/2016 -- Mega Bonus Spin: " CANADA2016 "
7/12/2016 -- 30,000 Free Chips Code: " LADIES2016 "
7/08/2016 -- 50,000 Free Chips Code: " MAINEVENT2016 "
7/08/2016 -- 10,000 Free Chips Code: " SOCCERCASHDASH "
7/07/2016 -- Mega Bonus Unlock Code: " JULY2016 "
7/04/2016 -- 10,000 Free Chips Code: " JULY4TH "
6/23/2016 -- 20,000 Free Chips Code: " MONSTER2016 "
6/21/2016 -- 20,000 Free Chips Code: " HILO2016 "
6/18/2016 -- 15,000 Free Chips Code: " Limit2016 "
6/14/2016 -- 15,000 Free Chips Code: " horse2016 "
6/13/2016 -- 15,000 Free Chips Code: " RAZZ2016 "
6/27/2016 -- 25,000 Free Chips Code: " tripledraw2016 "
5/21/2016 -- 5,000 Free Chips Code: " Pokerface "
5/19/2016 -- 5,000 Free Chips Code: " WSOPswag "
2/28/2016 -- 10,000 Free Chips Code: " NEWCODE "
50,000 Free Chips Code: " Chaser "
50,000 Free Chips Code: " bullets "
50,000 Free Chips Code: " shark "
6/18/2016 -- 15,000 Free Chips Code: " heatwave "
6/13/2016 -- 5,000 Free Chips Code: " cashdash "
6/9/2016 -- 500,000 Chips Code: " SURVEY16 "
5/19/2016 -- 10,000 Free Chips Code: " SPRINGFEVER "
5/18/2016 -- 10,000 Free Chips Code: " SAMMYG "
5/06/2016 -- 10,000 Free Chips Code: " PINATA "
5/06/2016 -- 7,500 Free Chips Code: " FIESTA "
5/06/2016 -- 5,000 Free Chips Code: " TACOS "
5/06/2016 -- 5,000 Free Chips Code: " MEXICO "
5/06/2016 -- 10,000 Free Chips Code: " CINCODEMAYO "
3/28/2016 -- 25,000 Free Chips Code: " wsopeaster2016 "
3/19/2016 -- 4,000 Free Chips Code: " spring2016 "
3/19/2016 -- 4,000 Free Chips Code: " hibernation "
3/18/2016 -- 4,000 Free Chips Code: " luckychips "
3/12/2016 -- 10,000 Free Chips Code: " WSOPMADNESS "
3/10/2016 -- 15,000 Free Chips Code: " PLAYTIKAREWARDS "
2/25/2016 -- 7,250 Free Chips Code: " Omaha101 "
2/19/2016 -- Mega Bonus Spin Unlock Code: " MEGA2016 "
2/14/2016 -- 15,000 Free Chips Code: " LOVEWSOP "
2/13/2016 -- 5,000 Free Chips Code: " winterBlizzard "
2/12/2016 -- 5,000 Free Chips Code: " Blizzard "
50,000 Free Chips Code: " POKERQUEEN "
50,000 Free Chips Code: " VIPER "
50,000 Free Chips Code: " BIGMONEY "
50,000 Free Chips Code: " SHORTSTACK "
50,000 Free Chips Code: " CHAMP "
50,000 Free Chips Code: " jacks "
50,000 Free Chips Code: " champion "
50,000 Free Chips Code: " primetime "
1,500 Free Chips Code: " holdem "
3,000 Free Chips Code: " omaha "
On desktop, you can copy & paste codes. You don't have to type each one of them. 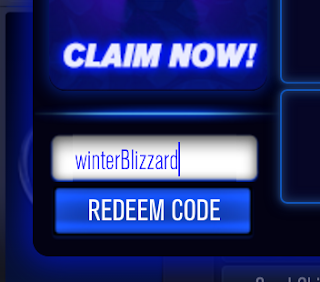 Simply double click the code and copy, then switch tab and paste it to the input box and hit "Redeem Code". The codes are case-insensitive (it doesn't matter if you type it on caps or lower case) all chips will be multiplied by your Status Bonus. 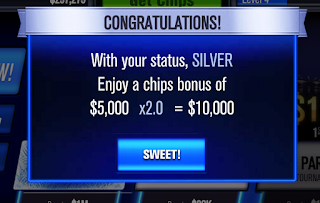 Example, If you receive 50,000 chips and you have a silver status you will get 100,000 chips. How to increase your Bonus multiplier? When you buy chips or level up, your TR Social Status will increase and eventually if you have enough points it will level up. In case you don't want to spend real money for this game you can level up your bonus multiplier by playing other playtika games like slotomania, house of fun slots, caesars casino, vegas downtown slots and bingo blitz. More Chips Daily on WSOP Free Chips Bonus page. The bonus page is a network of WSOP players sharing their wall posts and any free chips. Every time you play check the site to collect extra chips to increase your bank roll or recover from lost. Remember, WSOP is not all about how many chips you have. The true value is how good you are as a player, next time you play check your opponent user stats. The game is 50% skill and 50% luck. 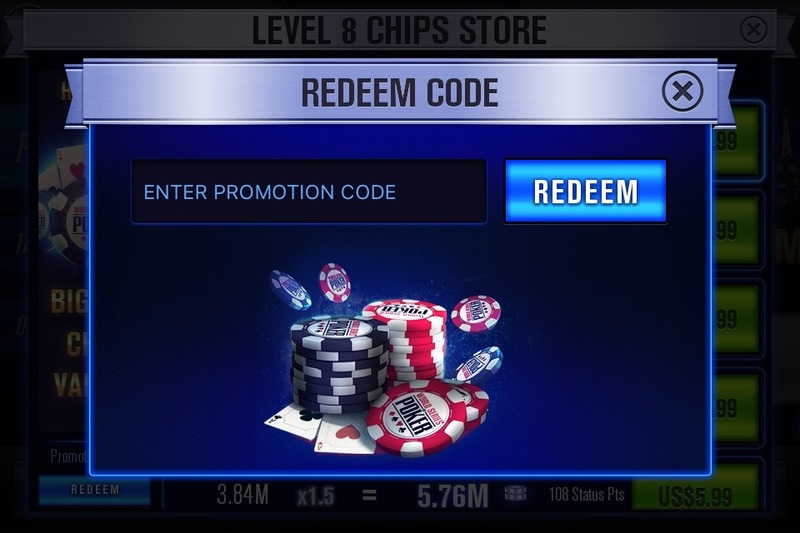 Go to the game Click "Get Chips"
Then at the left side bottom enter the promotion codes (On mobile tap Redeem button, a inputbox will appear type in the codes). For more Free Chips go to the WSOP Free Chips Bonus page. 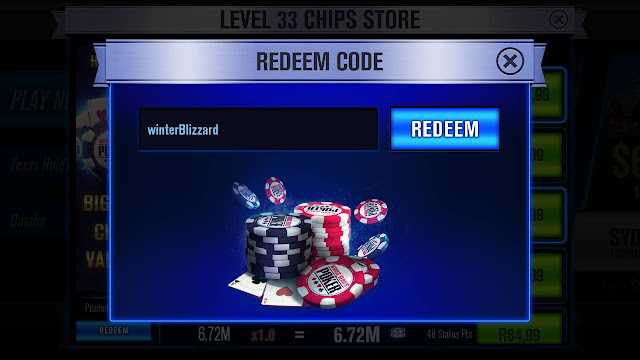 The Redeem codes and free chips from the bonus page will also work on mobile.